For low-income countries, the appropriate definition of "poverty" is often based on the minimum level of consumption needed to keep body and soul together. For higher-income countries, poverty is almost always set as a relative measure: that is, an amount that would be too far below the standards commonly prevailing in that society. As low-income countries become better off, they typically start raising their poverty lines. 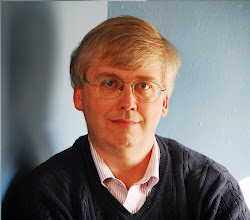 As Martin Ravallion points out in "A Relative Question" in the December 2012 issue of Finance & Development: "For example, China recently doubled its national poverty line from 90 cents a day to $1.80 (adjusted to reflect constant 2005 purchasing power). Other countries—including Colombia, India, Mexico, Peru, and Vietnam—have also recently revised their poverty lines upward." Ravallion and Shaohua Chen compiled a list of official poverty lines across 100 countries, and compare them to consumption levels per capita in each country. For the details of how it was done, see their working paper here. But here's the nice picture from Ravallion's F&D article showing the results. 1) As one might expect, what a country uses as its official level of poverty rises with the level of personal consumption. Ravallion writes: "The highest line is in Luxembourg, at $43 a day, while the United States, with a similar level of average consumption to Luxembourg, has a $13-a-day line. The relativist gradient is evident as consumption levels decline. The average poverty line of the poorest 20 or so countries is $1.25 a day—which is how the World Bank’s international absolute line was set. 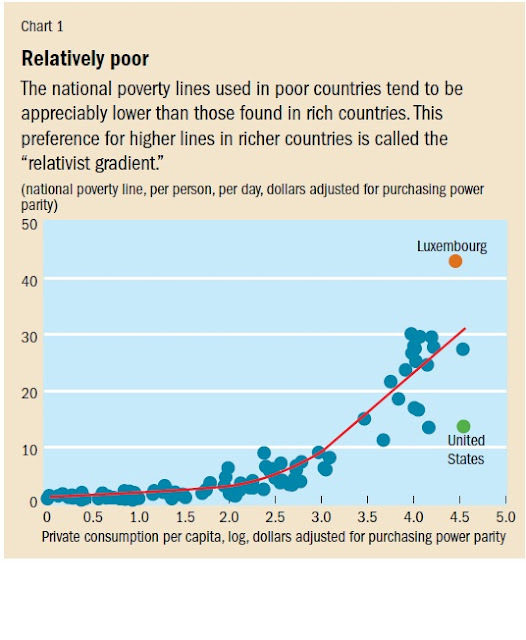 Even among developing countries that use absolute lines, countries with higher average incomes tend to have higher real lines. Across countries it seems that poverty is indeed relative." 2) The U.S. poverty line, relative to income is substantially lower than the poverty lines often used by other high-income countries. For high-income countries, where to draw the poverty line is a social and political decision. Of course, it's also fairly common in many U.S. anti-poverty programs to have benefits that extend up to 125% or 150% or 200% or more of the "official" poverty line. Still, one suspects that what each society labels as "poverty" reveals something about how that society perceives the issue of those with low incomes and how that society will react to those issues. 3) When an economy grows rapidly, it is quite common to have a situation where some regions and individuals expand their consumption more rapidly than others. Thus, it is possible to have a situation in which people are better off in absolute terms--that is, their level of consumption has risen--but in which many of those same people feel that in relative terms, they are now worse off compared the new social norms in their society. Emerging markets like the BRIC countries Brazil, Russia, India, and China are all in their own ways facing the social turbulence in which reductions in absolute poverty are not matched by reductions in relative poverty.